When you need a recreational reclining seat that's lightweight and portable, the Oniva Seat is for you. It has an adjustable shoulder strap and six positions for reclining. The seat cover is made of polyester, the frame is steel, and the seat is cushioned with high-density PU foam, which provides hours of comfortable sitting. The bottom of the seat is black so as not to soil easily. 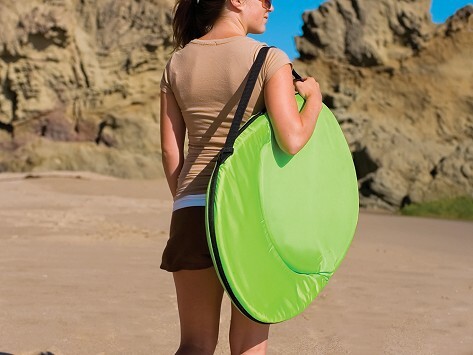 The Oniva Seat is great for the beach, the park, gaming, and boating. Dimensions: 29" x 22.5" x 2.5"
I’ve taken the seat to volleyball games. It’s very comfortable. Can’t wait to use for outdoor sports. I use this at home on my bed watching the TV and on my backless swivel stool. This is "just the ticket" for my seating needs. This is so useful to carry where ever you need the seat with back support! Light weight & easy to use. May need to order extras! Bring the comfort of home on the road with these portable outdoor chairs. 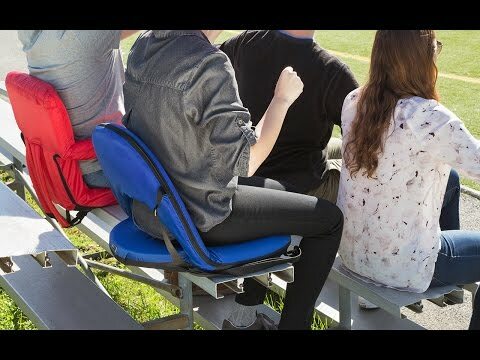 Suited for picnics, tailgates, stadiums—virtually anywhere you’d like to trade in wet bleachers or hard ground for something plush and recline-able. Picnic Time chairs are easy to carry, then adjust to your preferred incline. Their styles range from full-fledged armchairs to more minimalist stadium seats. Since 1982 the Founders of Picnic Time have been creating outdoor leisure products that inspire people to spend time with friends and family. They started with European-style picnic baskets, and branched out to seating that lets you sit comfortably almost anywhere.